Lets meet at the Nordic House! The Nordic House offers a lovely setting for your meeting. Our facilities can host moviescreenings, concerts, conferences and group meetings. We value personal service and will try to meet all our customers needs. A grand auditorium that seats 90 persons. Suitable for either concerts, conferences, meetings, screenings and receptions and dinners. The room is equipped with projectors for powerpoint and film screenings, basic microphones for up to 5 people, moving lights and a sound system for screenings and talks. We can provide live streaming of events for an extra fee of 40.000 included 3 hours (minimum) and there after ISK 10.000 an hour. You can see our livestream events here. We have two meeting rooms with great views and lots of daylight. Alvar Aalto room, seats 14-16 people and is equipped with a 65‘ flatscreen TV. Aino Aalto room, seats 8 – 10 people and is equipped with a 65‘ flatscreen TV. 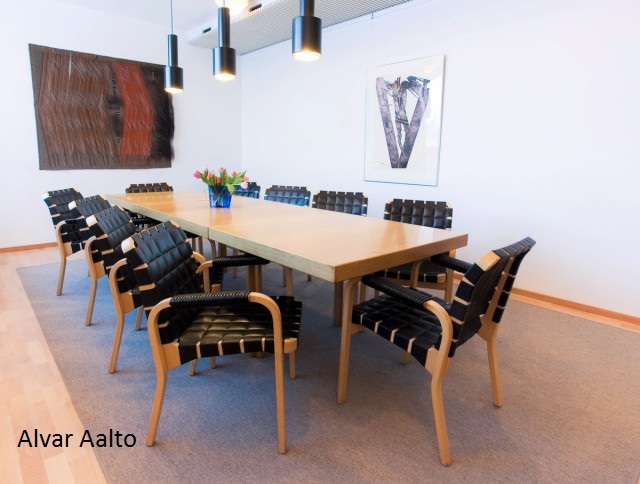 Both meeting rooms are furnished with AALTO’s design. Charged by the hour, 5000 ISK/hour. For evening arrangements please contact the reception. Regarding evening arrangements please contact the reception, tel. 5517030.